The Cowboy & The Cossack / Clair Huffaker; introduction by Nancy Pearl. Las Vegas: Amazon Encore, 2012, c1973. This is one of Nancy Pearl's "Book Lust Rediscoveries" series, a collection of titles that I've been greatly enjoying. Through this project, Pearl hopes to reintroduce some of her favourite works of forgotten fiction from the years between 1960 and 2000. 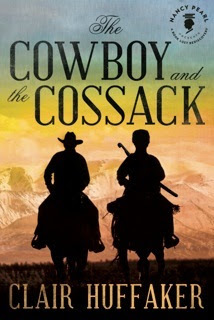 The Cowboy and the Cossack is a book I would have been pretty unlikely to discover on my own. It's a Western, with a twist: it takes place in Russia. In 1880, a group of cowboys is delivering a herd of 500 longhorns to Siberia, and when they get there they find out that a similarly sized group of Cossacks will be accompanying them on their cross-country journey. There is instant distrust on both sides, but through the lengthy journey and having to back each other up against wolves, Imperial soldiers, Tartars, and the like, they come to an understanding of each other's culture and develop deep friendships. This may sound a bit Hallmarky, but it really isn't. The writing is simple and straightforward but also philosophical, like many Westerns. It's a man's world and it's all about the male code, yet there is an appreciation for nature, for beauty and even poetry and music now and again. The narrator, Levi, is a young cowboy who idolizes his boss, Shad, and eventually also the Cossack leader Rostov, who seems to be a Russian counterpart to Shad. Through this cattle drive, Levi grows up, finally and completely, and much of the story deals with his coming of age. His innocence lends a freshness to the story and allows for a clear presentation of the newness of Russia -- Levi is noticing everything. There is also a good amount of humour and pathos in this book, and it reads very quickly. I enjoyed this and think that Huffaker has created a variety of characters who are fairly easy to keep straight -- and with 15 cowboys and the same number of Cossacks, it could have been very confusing. He includes characters who are Jewish, Black, and Native American, as well as the more usual cowboys, and the Russian characters reveal the distinctions in their culture as well. It was a really good read, and a reminder of the power of reading outside your usual genre. In the introduction to this book, Pearl talks a little about genre reading, and how, when she asks her students what genres they tend to read, NOBODY ever answers 'Westerns'. This made me think a bit -- I haven't read many Westerns in the last few years, but as a young teen I devoured all of the multitude of Louis L'Amour titles that my Dad owned. And I read a few Zane Grey and some really dated popular titles by forgettable writers from the early part of the century. So I went into this novel curious as to how I'd like it. Fortunately, I really liked it. And I'd love to ask my own blog readers: what genre do you usually gravitate toward? Do you read Westerns? My father likes westerns but I pretty much gave up on trying to find him new ones about five years ago. It was just too difficult to find them. There are far fewer traditional Westerns available now, I think. Though he might like this book, as a slightly different take on cowboy culture. Hmmm, we read most genres here, but seldom (never?) what would be considered "true" westerns. Though we do all enjoy those classic spaghetti westerns on film - The Good, The Bad & The Ugly & similar! I think my go-to genre is good old vintage middlebrow fiction, plus I do have a strong leaning towards biography/memoir/travel books. On that note, The Cowboy and the Cossack sounds fascinating. I think I've heard of this before, with positive connotations. Thank you for the review. I haven't read Bowering, perhaps I should! I know, westerns get overlooked by many readers. But there are a few that I've really enjoyed and was glad to discover this one. This book is my Dad's all time favorite book. I read it for the first time about 15 years ago. And I read it at least once a year. It's a fantastic read! It is very easy to connect on a personal level with each of the characters. It captivates from the very start! Isn't it great? I'm so glad to hear from another reader who loves this book.